A surface layer is defined as being up to three atomic layers thick (~1 nm), depending upon the material. 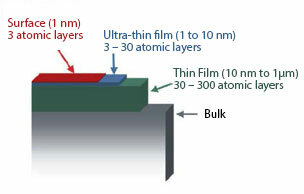 Layers up to approximately 10 nm are considered ultra-thin films, and layers up to approximately 1 μm are thin films. The remainder of the solid is referred to as bulk material. This terminology is not definitive however, and the distinction between the layer types can vary depending upon the material and its application. The surface represents a discontinuity between one phase and another and, therefore, the physical and chemical properties of the surface are different from those of the bulk material. These differences affect the topmost atomic layer of the material to a large extent. In the bulk of the material, an atom is surrounded on all sides in a regular manner by atoms composing that material. Because a surface atom is not surrounded by atoms on all sides, it has bonding potential, which makes the surface atom more reactive than atoms in the bulk. Back to What is XPS?